Jane Goodall is an expert on wild chimpanzees. Recognized for her ground breaking discoveries about their behavior – she discovered that chimpanzees make tools, eat and hunt for meat, and have similar social behavior to humans – she completely transformed our understanding of our closest relative in the animal kingdom. Valerie Jane Morris-Goodall was born on April 3, 1934, in the United Kingdom’s capital city, London. Her father, Mortimer Herbert Morris-Goodall, was a telephone engineer who became a racing car driver for Aston-Martin. Her mother, Margaret Myfanwe Joseph, was a secretary who later became an author, writing under the name Vanne Morris-Goodall. Both parents were from relatively wealthy families. The real Jubilee with her mother Boo Boo. Image by F.W. Bond. Jane’s first home was in the London suburb of Chelsea. She was looked after by a nanny for much of her childhood. When she was about a year old her father gave her a toy chimpanzee called Jubilee. The toy had been made to celebrate London Zoo’s first chimpanzee birth in captivity. Although, as she got older, she received other toys, Jubilee remained Jane’s favorite forever. Her family moved house several times while Jane was young. In 1935, when she was a year old, the family moved out of London to the town of Weybridge. Her father’s career as a racing driver was beginning to flourish and the move took them close to the famous Brookland’s racing circuit. In May 1939 the family moved again, this time to the seaside town of Le Touquet in northern France. Her father had now become a full-time racing driver and, with most of his races in continental Europe, this location was more convenient than anywhere in England. It also gave his daughters an opportunity to become fluent French speakers. However, their stay in France was brief. Within a few months of their arrival, World War 2 had begun. The family fled from France just before the war started, moving into Jane’s paternal grandparents’ large home in the English coastal town of Folkestone. No matter where she happened to be living, Jane’s childhood was happy. From an early age she loved animals and she enjoyed exploring gardens and observing the wildlife she found – anything from butterflies to slugs. Her family took in several pets, including a dog and a tortoise. At the age of five Jane went missing in Folkestone and a search was started for her. When she was eventually found, it turned out she had been sitting for several hours in the hen house. She had wanted to find out how chickens laid eggs and had sat waiting for one to come into the hen house so she could see for herself how it actually happened. While they were in Folkestone Jane’s father, who was 32 years old, joined the army. The family then moved to the small town of Hythe. Jane’s father was posted to France in 1940, at which point the rest of the family – Jane, her mother, and younger sister Judith – moved to her grandmother’s home in the beach resort of Bournemouth. Despite the war, the bombs she heard exploding, the blackouts, the food rationing, and her father’s absence, Jane lived contentedly in Bournemouth. She loved nature and collected many pets including racing snails, caterpillars, a lizard, guinea pigs, a hamster and a canary. 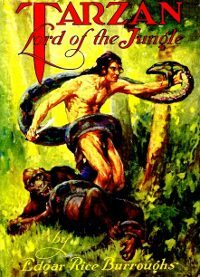 Jane Goodall loved Edgar Rice Burroughs’ Tarzan stories, featuring a hero who had been raised since infancy by a female great ape. Jane attended elementary schools in Bournemouth and developed a passion for reading. Her favorite books – Doctor Doolittle, The Jungle Book, and Tarzan – all involved people who were spectacularly close to animals and could communicate with them. She began to dream that one day she might be able to study animals in Africa. In 1945, aged 11, she began high school at Uplands School for girls. At the age of 12, she formed a nature club called the Alligator Club. It had three other members: her sister Judy and two of their friends. Jane organized club events and wrote a club magazine. As school continued, Jane became increasingly uncomfortable and unhappy. Jane was a happy, lively girl, and it’s clear from the quote that she did not enjoy the regimented life school offered her. She yearned to be at one with nature and with animals, but there was no place in school for these longings. Towards the end of school, Jane’s interest in English and biology picked up and she began enjoying learning again. She won two school prizes for essay writing. Her exam grades were good enough to go to university, but her family could not afford it. She continued reading nature books and dreaming of being with Africa’s magnificent wildlife. 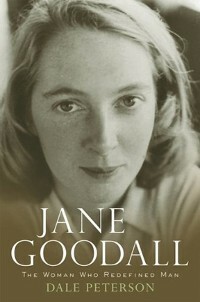 In 1953, aged 19, Jane Goodall enrolled at London’s Queens Secretarial College. She wanted to become a journalist, but her mother advised her to get a qualification first that would guarantee her a job. She graduated the following year, then moved from one clerical job to another, in Bournemouth, at Oxford University, and with a film company. Then the chance came for her to realize her dream and visit Africa. In the summer of 1955, Goodall replied to a letter from a former school friend who was planning to go to her family’s farm in Kenya. Her friend had asked if she would like to stay on the farm for a few months. Goodall saved hard for the fare, finally leaving for Africa in March 1957, traveling three weeks by ship. Africa turned out to be everything she had hoped for. Its wildlife was fascinating; magical; mesmerizing. She took an office job in Kenya’s capital city, Nairobi, where she met the paleontologist Louis Leakey, curator of Nairobi’s natural history museum. Leakey believed that humans and chimpanzees shared a common ancestor, an idea advanced in earlier times by Charles Darwin. Leakey was impressed by the young woman he met: not only by her enthusiasm, but also by how much she knew about natural history. He asked her if she would like to work as his secretary, which she agreed to. In fact, although he said nothing at first to Goodall, Leakey was actually looking for someone to research chimpanzee behavior. He thought Goodall was probably the perfect candidate. He did not want the research to be carried out by anyone with the preconceptions of a typical university academic. He wanted someone who would look at chimpanzees with fresh eyes. He hoped this might uncover evidence of behavioral similarities in humans and chimpanzees that would help make the case for his common ancestor theory. Moreover, he believed that studying chimpanzee behavior would open a window on the behavior of Homo sapiens’ ancestors. 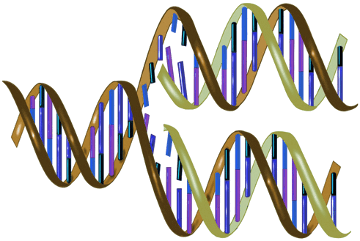 Nowadays analysis of DNA has established that the chimpanzee is our nearest living animal relative and that we share a common ancestor dating back about 7 million years. DNA analysis was not available to Louis Leakey, who needed to gather evidence in other ways. Before beginning secretarial work for Leakey, Goodall spent time with a team including Leakey and his wife Mary searching for hominid fossils in Tanzania. It was there Leakey made the decision: Goodall would become his team’s chimpanzee researcher. In 1958, aged 25, Jane Goodall traveled back to London and spent some time in the offices of experts in the fields of primate anatomy and behavior. In the summer of 1960, Leakey had raised enough money to fund her work, and she returned to Africa. There she traveled to Gombe Stream Chimpanzee Reserve in Tanzania to begin her observations. Her mother accompanied her for the first few months. They were alone in the untamed African bush – an incredible adventure. Gradually they befriended fishermen and tribes people who lived in the surrounding area. The chimpanzees living on the reserve were not used to humans. For the first few months the chimps ran away whenever they saw Goodall. It was, however, not only the chimps who needed to be cautious. People sometimes forget that chimpanzees are immensely strong animals: adults are strong enough to literally pull a human apart. It takes nerve to get close to wild adult chimpanzees. Leakey had told Goodall that if she was calm and meant no harm to a chimp, the chimp would most likely sense this and not be hostile. The first chimpanzee to accept Goodall she named David Greybeard. 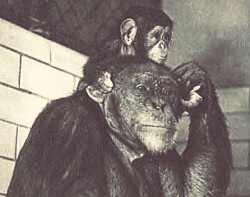 (Naming chimpanzees was an unusual practice for a scientific study.) With David Greybeard’s acceptance, other chimps began to be less timid. In fact, after they grew more used to Goodall, some became initially rather hostile. On these occasions Goodall had to stay calm and not give in to fear: many people would have in similar circumstances. One day, Goodall noticed that David Greybeard, searching for a snack, utilized a piece of grass to pull termites out of a termite mound. Another day she saw him strip leaves from a twig to make a better tool to get at termites. This was a groundbreaking moment – the first time in history that an animal other than a human had been recorded making and using a tool. 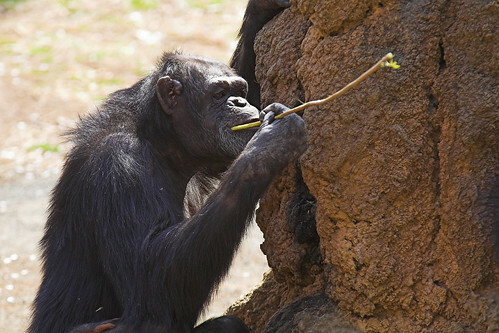 A chimpanzee eats termites gathered on a twig tool. Image by Su Neko. A few weeks later, Goodall noticed David Greybeard climbing a tree holding something that looked like meat. Using binoculars she saw him eating the meat. A female chimp was also there, begging for a share. At the bottom of the tree were two aggressive looking pigs. The meat David Greybeard was eating was a piglet. Goodall then witnessed a hunt. 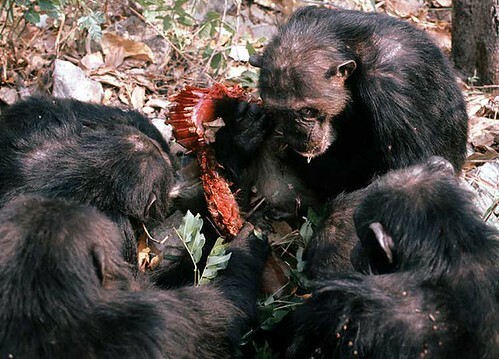 A group of chimpanzees caught, killed, and ate a monkey. Chimpanzees eating a columbus monkey. Image by David Bygott. Another of the significant discoveries Goodall made was that male chimps patrol the borders of their territory. If they meet a solitary male from another chimpanzee tribe, they will chase, attack and, given the opportunity, kill him. She likened this behavior to that of human criminal gangs protecting their territory. With a number of major discoveries under her belt, Louis Leakey advised Goodall that she should get an academic qualification. This would enable her to get funding as an independent naturalist for her own projects. He arranged for her to go straight into a Ph.D. course at the University of Cambridge. The subject was ethology – the study of animal behavior. Her supervisor taught her to write her work in such a way that it would be less open to criticism as ‘non-academic’ or ‘anthropomorphic.’ Scientists would not entertain the idea that animals could exhibit human type feelings or behavior. Goodall graduated in 1965 with a thesis entitled Behavior of the Free Ranging Chimpanzee. National Geographic began sponsoring Goodall’s work, and in 1963 she published her first article for the organization entitled My Life Among Wild Chimpanzees. A book My friends, The Wild Chimpanzees soon followed. Then came a television documentary series Miss Goodall and the Wild Chimpanzees, which was a big success. Goodall was by now well-known for her work in Africa. Goodall recorded chimps hugging and kissing each other, developing strong mother and child bonds, and using their wits to out-think social rivals. Such observations seemed to prove that humans and chimps have much more social behavior in common than was previously believed. Goodall learned that chimpanzee mothers are not born with the knowledge of how to care for their offspring. Mothers are taught this by their own mothers. Goodall saw that good mothers engaged their older daughters in the care of their younger daughters, teaching them effective mothering skills. Poor mothers produced daughters who also tended to be poor mothers. The Gombe Reserve became a National Park in 1968 and Goodall continued to carry out research there for most of the next twenty five years. She wrote In The Shadow of Man, published in 1971, which dramatically detailed the life of the Gombo chimps. Many more books followed. From 1970–1975, Goodall held a Stanford University professorship. In 1973 she was appointed honorary visiting professor of Zoology at the University of Dar es Salaam in Tanzania. In 1977, she founded the Jane Goodall Institute to support the research at Gombe and protect chimpanzees in their habitats. In 1986, aged 52, she ended her time at Gombe and published her research in the comprehensive book The Chimpanzees of Gombe: Patterns of Behavior, based on 26 years of observations. Goodall’s career direction changed in the 1990s as she realized that deforestation was having a devastating effect both on the wildlife and on the people in Tanzania. She became a strong advocate for sustainable development. In 1991, she founded Roots and Shoots which has become a global youth community action program to improve the environment for people and animals. Goodall also became a strong advocate for better conditions for captive chimpanzees and for ethical treatment of captive animals used in research. 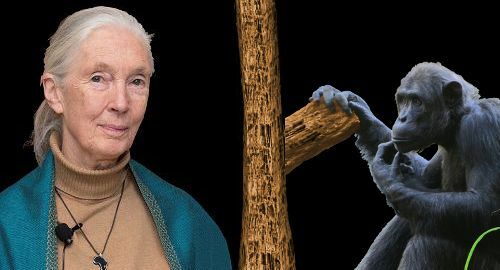 Thanks in part to her efforts a number of advanced countries have now placed a total ban or severe restrictions on using great apes in research. These countries are Austria, Germany, Holland, New Zealand, Sweden, and the United Kingdom. In 1950, Jane Goodall’s parents divorced. They had seen little of one-another following the outbreak of World War 2. Her father had begun army life with the rank of private. He was eventually promoted to lieutenant colonel and spent nearly all of his time during and after the war on overseas postings. In 1964, Goodall married the photographer and filmmaker Hugo Van Lawick. They had one son, named Hugo. In 1974, she divorced her first husband and, in 1975, married Derek Bryceson, member of Tanzanian parliament and Director of Tanzania’s National Parks. He died in 1980. All her life Goodall suffered face blindness – the official name is prosopagnosia – difficulty distinguishing and remembering faces. She only discovered this was a medically recognized condition when she was about 60. Jane Goodall continues to work tirelessly in the interests of chimpanzees and natural habitats. 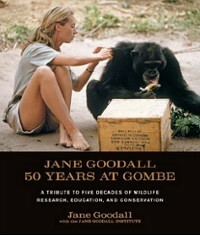 "Jane Goodall." Famous Scientists. famousscientists.org. 14 Dec. 2015. Web.